I'm a total sucker for any lip balm or lip treatment out there. I've struggled with dry, chapped and frankly awful lips for years. I've tried everything under the sun to help make them better and in the process I've found out that so many products that are listed as treatments for sore lips tend to actually cause more problems so you to keep buying them. Urgh. So when I discovered that Bomb Cosmetics have their own range of lip balms and treatments, I had to try at least one of them! After a lot of ooo-ing and ahh-ing over their little range of balms, I decided to buy the 'What A Melon!' intense lip treatment. For £2.49 you get a little pot of clear balm that I have been using pretty much none stop since it arrived last week. As soon as I started using this, my lips have been feeling a lot softer and matte lipsticks aren't drying out my lips as much anymore, which is a massive plus to me as I wear them nearly everyday. What A Melon is definitely a treat for any watermelon lovers - think of the smell of those little watermelon sweets you can get and that's exactly what this balm smells like! Even though I've been using this as often as I've needed to, I seem to have barely used any product so I'm expecting this to last me a pretty long time, which I'm grateful for as I go through lip balms like there is no tomorrow. I'm certianly looking forward to trying out the rest of the range that Bomb Cosmetics have and will pick a few different ones up on my next haul. Have you tried any of Bomb Cosmetics lip treatments? 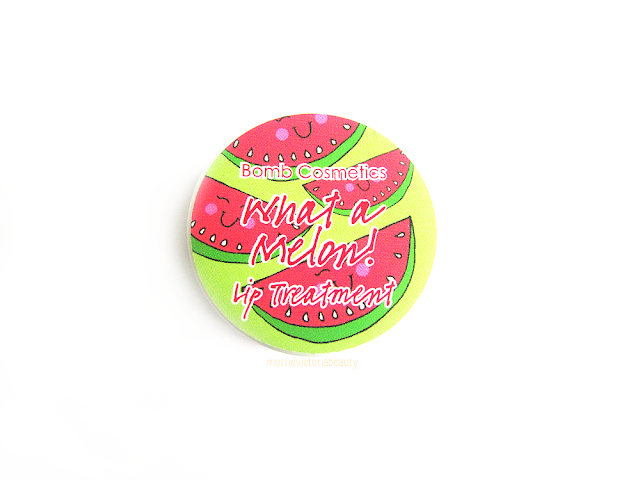 Are you a fan of watermelon scented/flavoured beauty products? Have you seen our Sherbet Lemon Lip Scrub? It has SAVED my lips this winter! I love the sound of this, I only ever think of Bomb Cosmetics as doing bath bombs! I have such a problem with matte lipsticks drying out my lips so I definitely could use this! It sounds like it smells so lovely!! I've not heard of this brand before now but I must check them out! Watermelon sounds sooo incredible.